Anybody who spends most of their day on the internet should know all about lulz. Lulz are most often jokes made at the expense of web users, as popularized on 4Chan. Today, a consortium of hackers called LulzSec is attempting (and in some cases succeeding) in efforts to shut down some of the games that offer web users a giant share of their online fun. World of Warcraft, League of Legends, EVE Online, and Bethesda Softworks have all been targeted by LulzSec's hacking efforts in the last week, leaving the games community to wonder: why? A rap track anonymously composed about Lulzsec. Details are sketchy. It is unclear where LulzSec comes from, or what their goal is. Their mission statements, issued alongside caches of stolen data from Bethesda and senate.gov displayed on their home page and Twitter feed, indicate a desire to bring "fun" to the internet. Presumably they are being sarcastic like Dr. House, for they have impeded on the fun of many of those (MMO players) who derive great joy from the online experience. "We actually like this company and would like for them to speed up the production of Skyrim, so we'll give them one less thing to worry about. You're welcome! 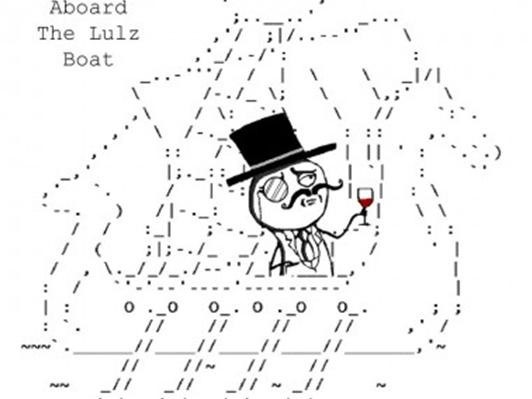 :D"
Lulzsec's Twitter avatar on board their ASCII logo, The Lulz Boat. Really? Someone launched a coordinated multinational DDoS attack on the severs of the most popular online games in the world AND broke into the mainframes of Bethesda, the US government, Sony, and Fox simply to get info on a highly anticipated upcoming game? Doubtful. The inclusion of Minecraft on the LulzSec hit list raises further questions. Most of the game servers LulzSec has targeted, including League of Legends, WoW, and EVE Online, are all the works of major capitalist enterprises. That makes them ideal targets for hacking by the standards of pervious major hackers. Minecraft, however, is an indie game despite its massive success. Notch, its creator, has spoken out in favor of liberal digital piracy laws as well, placing him firmly in line with the pro-net-neutrality and anti-corporate bent of most hackers. The simple fact of Minecraft's targeting renders any attempt at classifying LulzSec's targets as a group moot. As a game and an entity, Minecraft is unlike any of LulzSec's other targets, and if anything lends credence to the idea that these attacks are anarchist rather than favoring a particular change in a particular system. LulzSec has certainly established itself as a visible player on the web, second perhaps only to Anonymous in terms of hacker group name recognition. While it is unclear exactly what they plan to get out of their work, it is certainly interesting. Stay tuned for updates on their attacks and possible motivations. Images courtesy of seriouslulz and All Things D.
The link in the first post points to a blog that goes into detail about lulzsec's defection from Anon and how that lulzsec member was uncovered by several methods. Nice Boat.